Breakfast is the most essential meal of the day, and restaurants that serve breakfast every day of the week know what’s good. It was hard to slim down a list to 10, but these are the absolute Best Breakfasts in Denver. 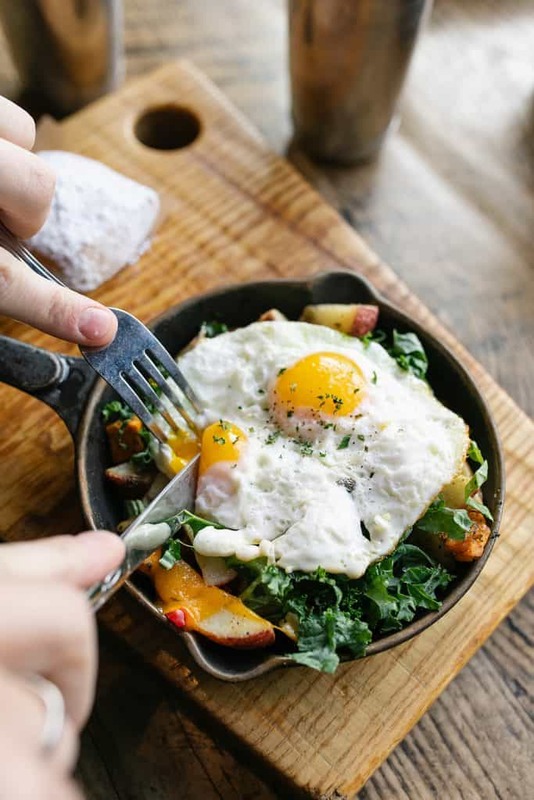 This list only includes restaurants that serve a full breakfast menu every day of the week and excludes chains with the exception of Snooze (we just had to include them, they started in Denver!). 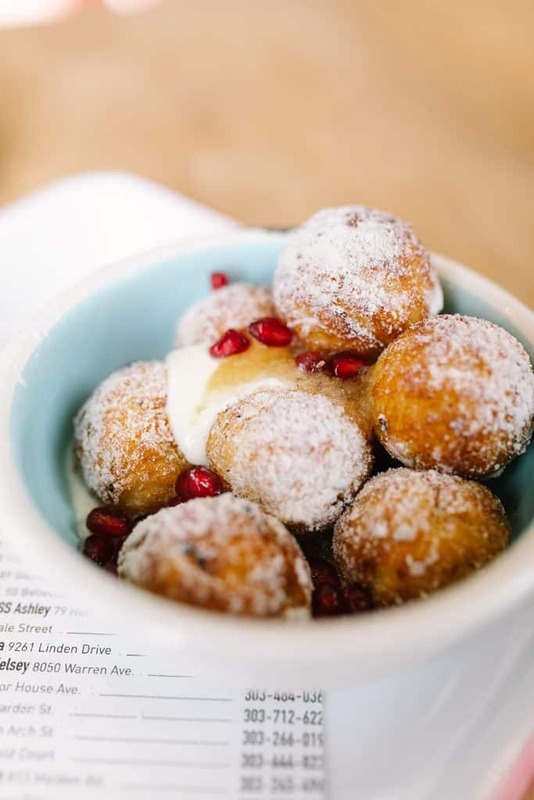 With so many new options that have popped up in the last few years here, the choices can be a little overwhelming but we hope this list helps all on their quest for breakfast utopia. There is a place here for every palate so we recommend going to all of them at least once! A great bagel can sometimes be hard to find this far west, but Rosenberg’s (located in an older street on Five Points) does it right. 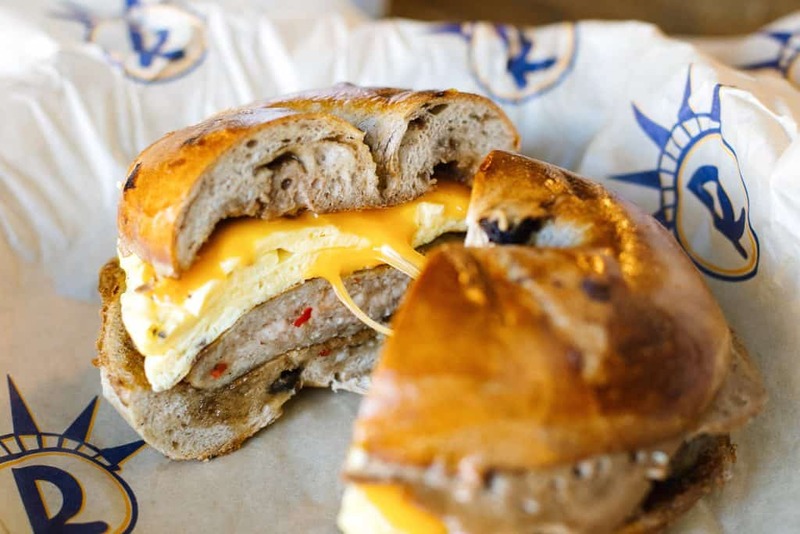 A bagel is never just a bagel, and we knew we had to include Rosenberg’s in our list of best breakfast in Denver list. The owner, Josh Pollack, is originally from New York and is so obsessed with the correct way of making bagels that he adjusts the mineral content of the water that goes into the dough to mimic New York City tap water as closely as possible! Walking into their original Five Points location also feels like one is stepping into a New York deli, albeit much more spacious. Get their Standard, a bagel sandwich with plain cream cheese, house cured and hand sliced Gravlax, tomato, capers, and onion (their salmon is sourced from Seattle Fish and is all smoked and cured in house) or opt for a more classic bacon egg and cheese. We recommend the Frenchie, a french toasted cinnamon raisin bagel with local Polidori sausage, melted sharp cheddar cheese, and scrambled egg, drizzled with maple syrup. If that’s not filling enough, take a babka slice or rugelach to go! Look no further to get one’s biscuits and gravy fix! Denver Biscuit Co has four locations around Denver, and their flaky yet rich and fluffy large biscuits will reel anyone in immediately. With 11 different biscuit sandwich options and seven different biscuit plates to choose from, we find it best to order a few savory and sweet options to share with friends so you can try a little bit of everything! Order the Three Run Double (a buttermilk biscuit served with 2 eggs, side of meat, jam, and honey butter), the Vegetarian Biscuits and Gravy, or the Franklin (their most ordered breakfast sandwich, which comes with buttermilk fried chicken, bacon and cheddar cheese smothered in housemade sausage or vegetarian mushroom gravy, always add an egg). And if you have extra room for something sweet, order the famous giant biscuit cinnamon roll- so decadent! No matter what one end up ordering, make sure to come here hungry because you’ll leave stuffed to the brim! Be prepared for a line out the door on weekends but know that the wait is worth it. Walk into Sassafras on Colfax and you’ll feel as though you’ve walked into a quaint little breakfast spot in the South. With it’s antique decor, mini chandeliers, colorful cloth napkins, housemade jams and hot sauces on the tables, and Bluegrass & Cajun tunes floating through the restaurant from the speakers placed throughout, this is one of the coziest and best breakfasts in Denver you’ll experience. Sassafras is open for breakfast and lunch, and you’ll find items such as beignets, three varieties of shrimp and grits, cornbread and biscuits scattered through the menu. If you go with a friend who’s down to share, we recommend going for something savory and something sweet to split! 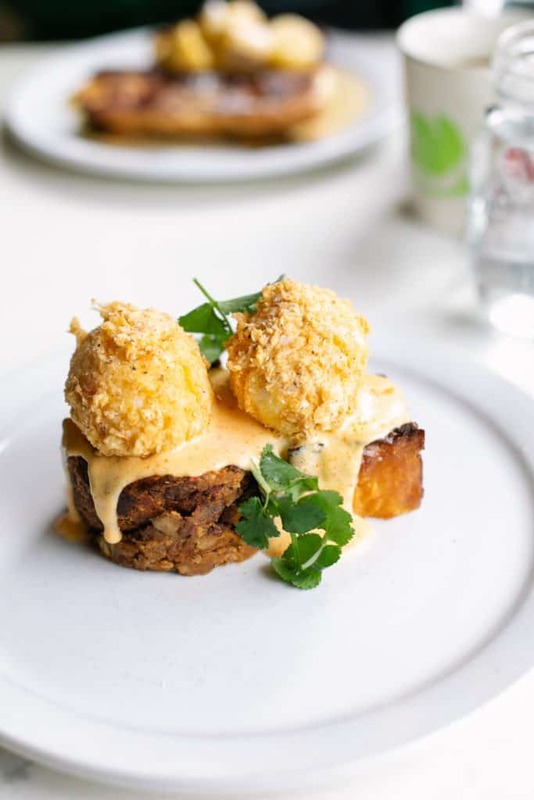 We suggest the Chicken Fried Eggs with Buffalo Hash, made of pecan wood smoked free range buffalo, fried six minute eggs (yolky perfection), jalapeño cornbread and fresno chili hollandaise and the Bananas Foster Pain Perdu. Bacon lovers rejoice! 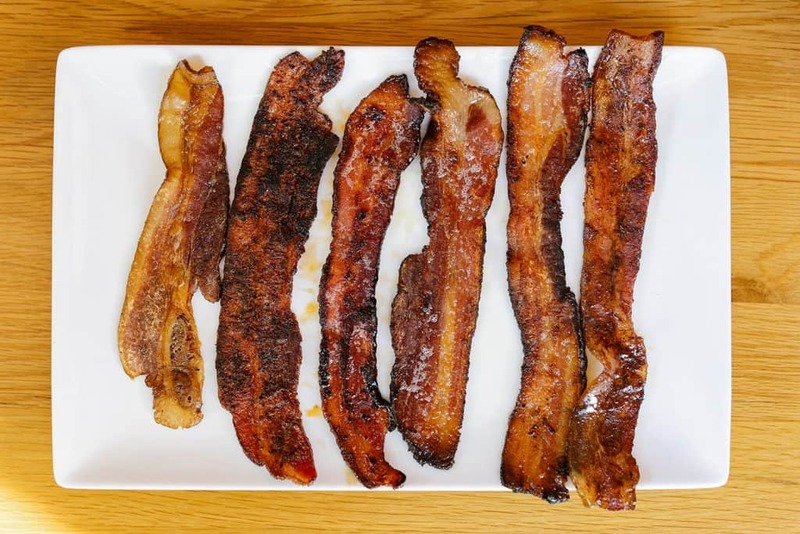 The menu from has been crafted around six different bacon flavor profiles: habanero, garlic, candied, applewood, paleo, and a chef’s selection (unique flavors like french toast!) which you can also order a flight of (highly recommended). Located in a large space at Cobbler’s corner in the Sunnyside neighborhood, this restaurant makes a great location for going out with a group of friends, especially in the summertime when one can sit out on their spacious patio. 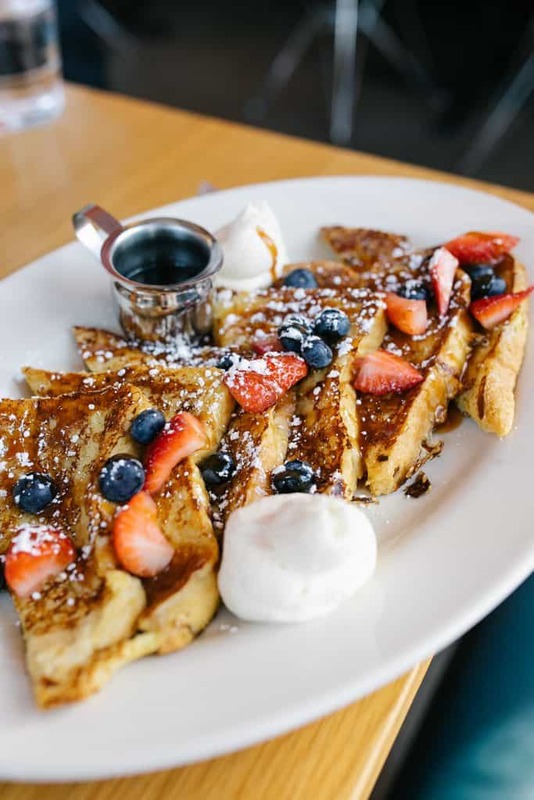 Take a sweeter route with the Sunshine, their lemon ricotta pancakes or the Boozy French Toast- Challah bread slices topped with Grand Marnier, berries, bourbon bacon caramel, and vanilla whipped cream. Or go the savory route with one of their Whole Hog Omelet or Bacon Hash. If you’re looking for something a little lighter and not so bacon heavy they do have a Lighter Side menu box with options like avocado toast or a veggie scramble. A list of the best breakfast in Denver would not be complete without this bacon-heavy spot. 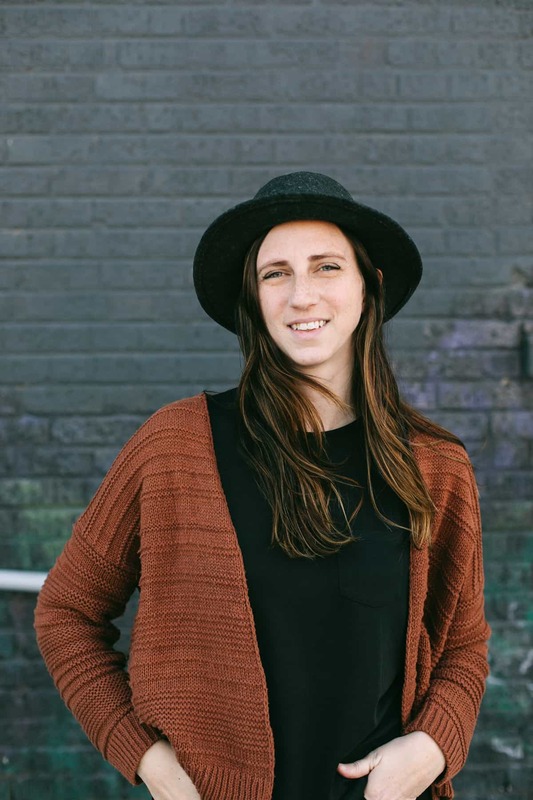 Olive & Finch has two locations in Denver but their Uptown location is our favorite. It’s on the smaller side but feels so cozy and welcoming and you can’t beat walking in and being greeted by a full bakery/pastry display! Their second location in Cherry Creek is a little more spacious with more of an upscale vibe. 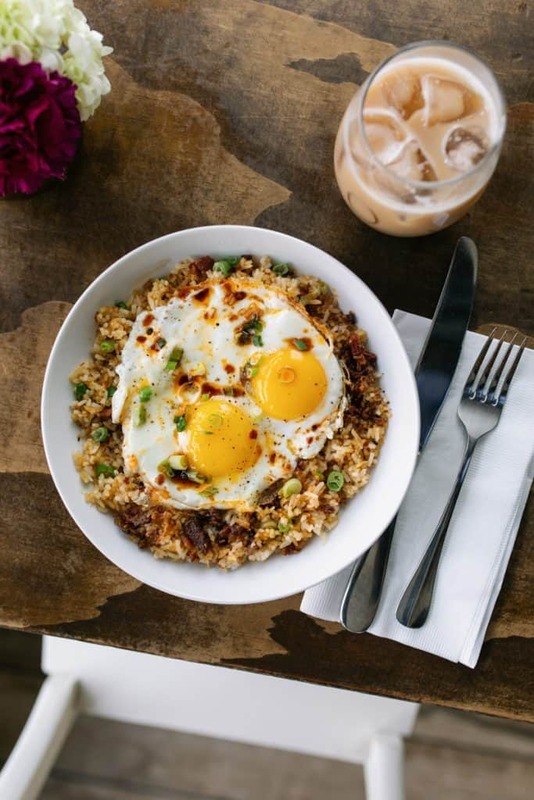 Of all the restaurants included in this list of the best breakfast in Denver, Olive & Finch is more of a fast-casual spot– order at the counter and get a light snack to go or take a seat, go ahead and make some friends at a communal table! Don’t let the fast-casual throw you off though, they make all their food with local, organic and sustainable ingredients and there are plenty of exciting and healthy options on the menu. They have a great price point, the menu is small but powerful and easy to navigate, with none of their meals being over $12. One of our favorite things was that a beignet is offered as a side option! I highly recommend doing this and pairing a meal with one of their fresh pressed juices. Pictured is the Green Eggs & Sam sandwich, made with two scrambled eggs, provolone, spinach, basil pesto and roasted tomatoes served on house-made focaccia (divine), with a choice of fruit, buttermilk biscuit or beignet, and the Bogota Hash, made with two sunny side eggs, chorizo, roasted sweet and white potatoes, roasted red peppers, caramelized onions, cheddar cheese and kale, served with fruit, buttermilk biscuit or beignet (get the beignets, obvs). 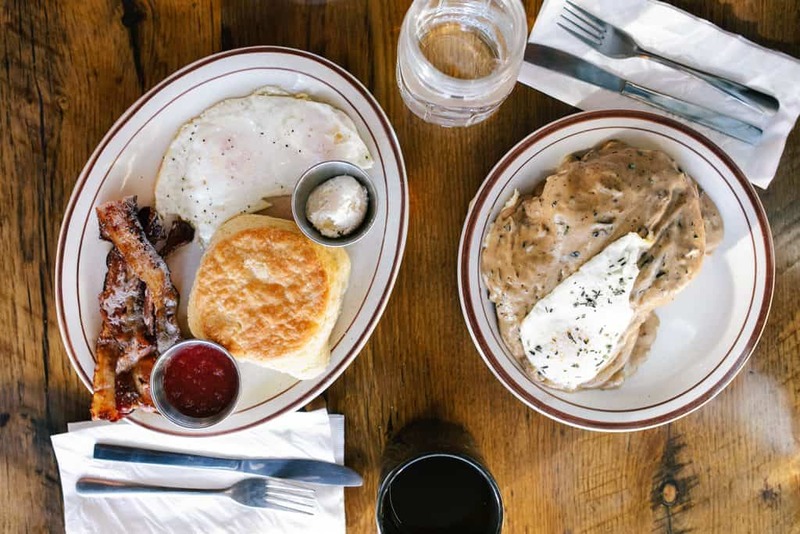 We’re covering Steuben’s Arvada location in this list of the best breakfast in Denver because their Arvada location has breakfast starting at 8am every day of the week, but their Uptown location offers brunch on weekends only, starting at 9am. They have the cutest classic American diner interior design, with plenty of banquette booth seating to choose from, old-timey snacks at the register, and retro lighting galore, one will feel like they’ve taken a step back in time upon entering. 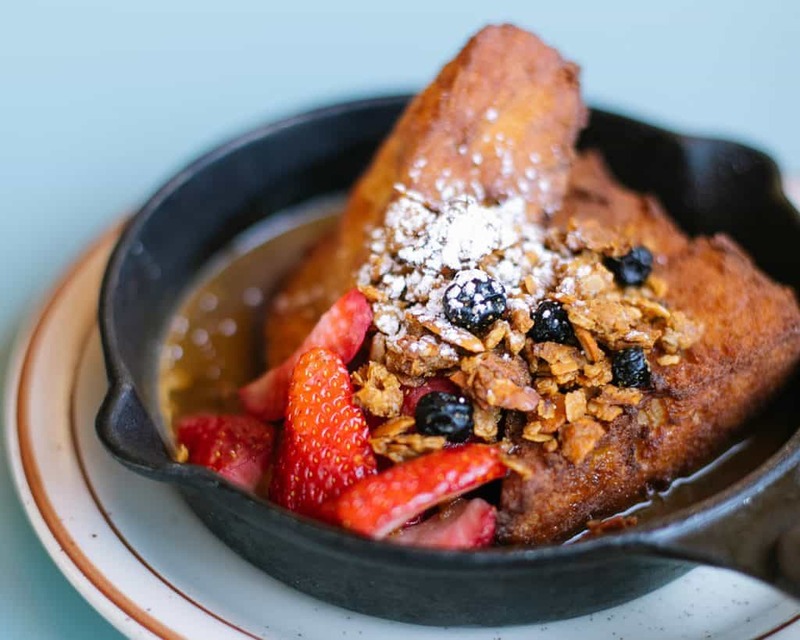 There is no shortage of modern diner style food options on the menu, like the Traffic Jam – 2 eggs any style, green chile cheese fries, Farmer John bacon, sausage gravy, or the Cast Iron French Toast, topped fresh berries, granola, house-made caramel sauce (this dish is TDF). The French toast is one of our favorite menu items, the bread has a crispy exterior so it doesn’t get soggy, and a light fluffy interior. Dessert for breakfast perfection! Steuben’s is one of the few restaurants on this list of best breakfast in Denver that is open all day, and several of their breakfast menu items can be ordered all day long, including Joe’s breakfast, Huevos Rancheros, the Smothered Breakfast Burrito & the Avocado Goddess Toast…breakfast all day- yes, please! Nationally acclaimed and worth every ounce of hype, Call is without a doubt on our list of the best breakfast in Denver! 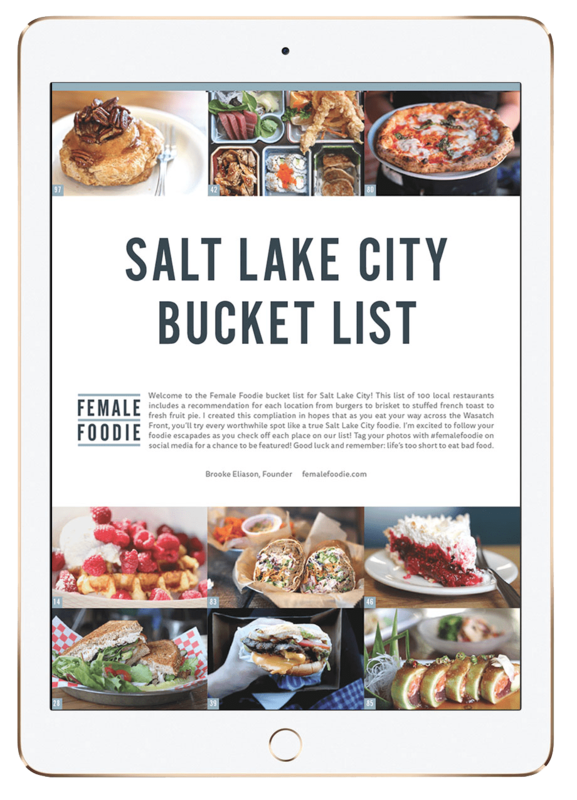 Located on Larimer Street in the RiNo neighborhood of Denver, this café is small but mighty, each dish on the menu fresh and vibrant, creatively made with a variety of flavors, plus a rotating bakery and pastry display by the register and a full espresso bar. Seating is a little limited inside, but they have a large outdoor seating area in front that’s perfect on warm sunny days, with a few pet friendly tables on the side as well. The interior is bright & airy, Scandinavian inspired with lots of reds and whites and a clean aesthetic, and has an open kitchen so one can watch their food being made. 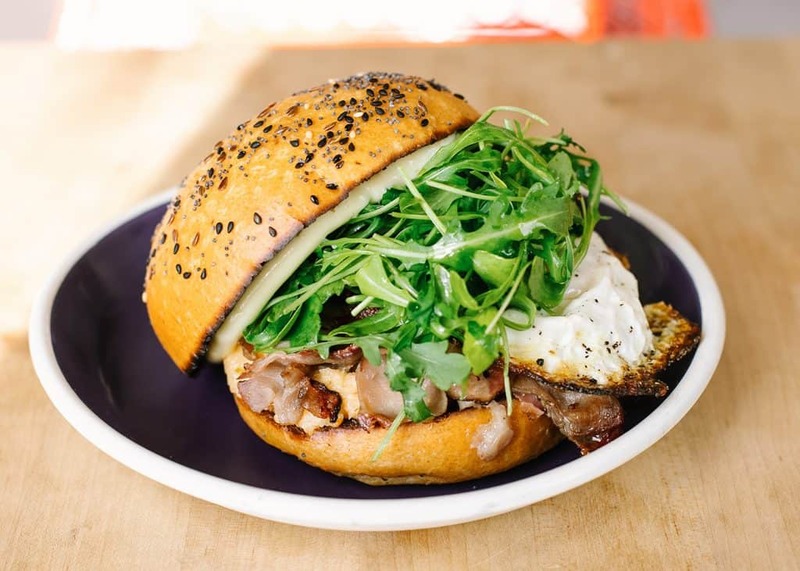 The menu changes seasonally, but three menu staples are their Aebleskivers (toppings vary seasonally), the Pork & Fried Egg sandwich, and the Chicken Salad Sandwich. Everything is made and prepared in house- sourdough starters, pastries, tartines, & the chicken is baked & confit in house. They source their produce & meats from local ranches in Colorado as often as possible as well. Call is a great place to bring friends who eat a gluten free diet- gluten free bread is always available, brownies are gluten free and occasionally pastries will be made gluten free. Onefold is different than most in town. You won’t find benedicts or waffle and pancake combos here, like most restaurants that serve the best breakfast in Denver- instead, satisfy one’s hunger cravings with a hearty bowl of Bacon Fried Rice, which comes with 2 duckfat fried eggs, bacon, garlic, green onions, tamari soy sauce, chili oil, or perhaps their Congee, rice porridge cooked in chicken stock, duck confit , poached egg, green onions, tamari soy sauce, salted ginger and chili oil. Family owned, the handful of items on the menu highlight the Chinese-American and Filipino roots of owners Terese and Mark Nery. 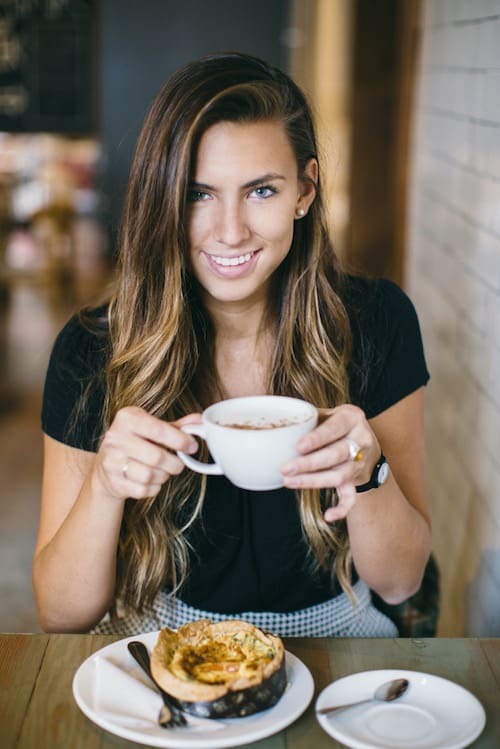 They are committed to using ingredients sourced locally & organically whenever possible (there is a list of their ingredient sources on their website! ), and their dishes are inspired by family recipes. The two most popular breakfast items are their Bacon Fried Rice and the Breakfast Burrito, which can be made with meat, or vegetarian or vegan! The space is small and cozy, but bright and cheery with plenty of green plants placed throughout the space, which makes it a nice place to go for a breakfast date but be sure to get there early on weekends as the line can go out the door. Snooze is a Denver classic that has expanded now into California, Arizona and Texas! The restaurant was founded in the Ballpark neighborhood of Denver by two brothers in 2006 who wanted to evolve the morning dining experience (and the best breakfast option for ealy birds- they open at 6:30 am!). Come here for some of the best breakfast in Denver for nearly every appetite with their well-rounded menu containing over thirty menu items to choose from. Servers here always recommend choosing a few things off different sections of the menu and sharing with friends so all can get a taste of everything and we second that recommendation! Their Benedict menu has six different variations, but they’ve made it easier to narrow down one’s selection with the Benny Duo option, where you can choose two to try. Their pancakes are the best we’ve tried from any restaurant, period. 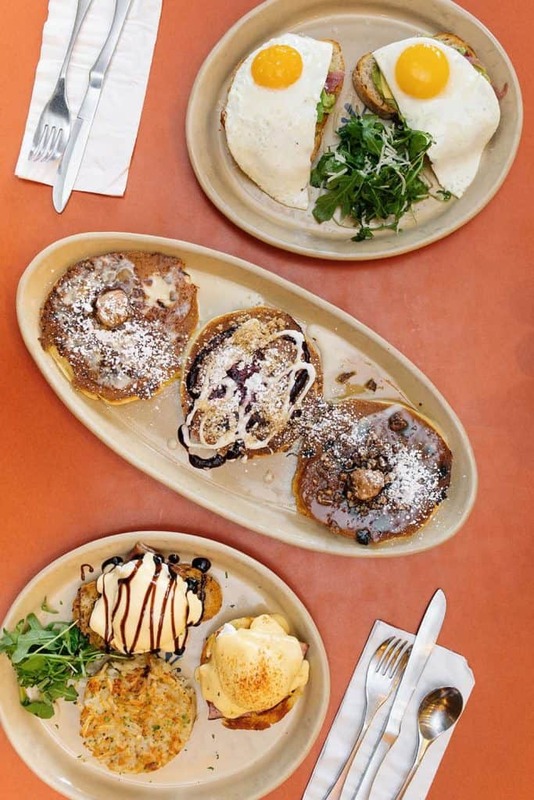 The Cinnamon Roll Pancake is off menu but one of their most popular, and again for those who have a hard time making up their mind, you can order the pancake flight and receive three different pancakes! Yes!! Their newest menu section is the “Like a Feather” category, featuring healthy options including the BRAVOcado toast & make it grain bowl. For those with sensitive diets, you can swap out any proteins on the menu for soyrizo & tofu, and any of the pancakes can be made gluten free as well. With so many options and all of them winners, Snooze will most definitely always be on our list of the best breakfast in Denver. Stowaway Kitchen serves the best breakfast in Denver. Owned by a couple who brought their vision and experience from working at cafes in Australia to Colorado, they believe one should be able to get a decent coffee & poached egg in the same place. They have a walk-up coffee counter right when walking in if you just want to take a drink to go, or plenty of tables indoors and out to sit at if you’re looking to stay and enjoy more drinks and food! With their tall, bright white walls, tropical plants all around, sunlight filtering in through several skylights, fresh flowers on the tables and art throughout, it’s a place you could easily spend an hour or two talking with a friend over breakfast or taking some time to work remotely for a bit. Their wholesome, gourmet and culturally diverse menu changes seasonally and pastries vary daily, all made in house of course. 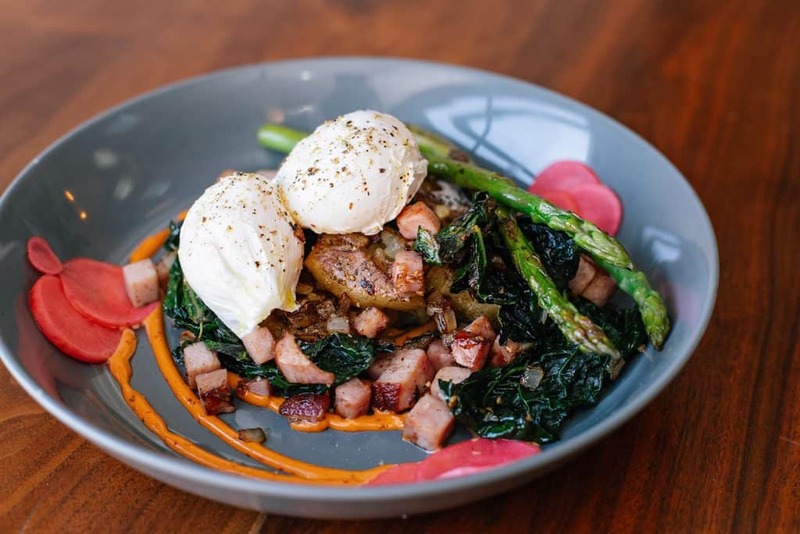 The Colorful Colorado is one of our favorites and always on the menu- a salt and vinegar potato hash, Niman Ranch ham, pickled radishes, asparagus and spicy adobo sauce with poached eggs. 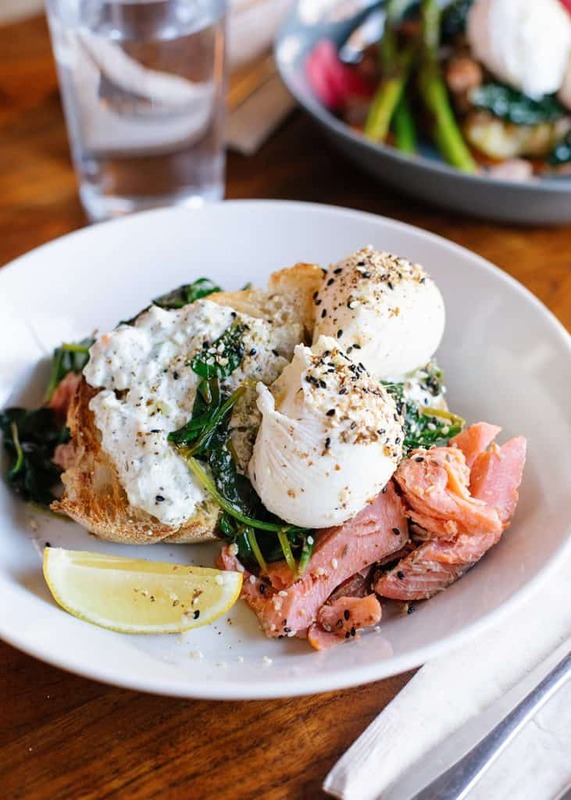 We also recommend the Dukkah Eggs and Trout: house smoked trout, tzaziki, sautéed spinach, and poached eggs topped with dukkah on sourdough. Try both with a friend for a hearty and exciting breakfast, at one our top choice for the best breakfast in Denver!